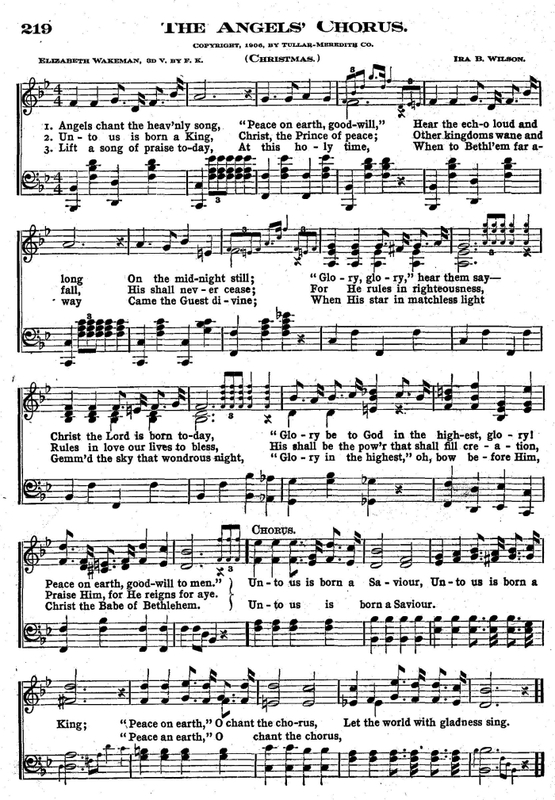 Source: I. H. Meredith and Grant Colfax Tullar, eds., The Bible School Hymnal. New York: Tullar-Meredith Co., 1907, p. 219. "Glory be to God in the highest, glory! Peace on earth, good-will to men." Let the world with gladness sing. Praise Him, for He reigns for aye. Chorus. Christ the Babe of Bethlehem. Chorus. This song has some unusual phrasing. See the sheet music, above. Meaning no disrespect to Mr. Wilson, this might be a good project for an aspiring composer.